The GrowGreen cities of Wroclaw and Manchester partnered up recently to host a training session at the Open European Day of Resilient Cities 2018 on involving citizens in designing and implementing nature-based solutions. Nature-based solutions and engaging citizens in climate change adaptation were major themes at the Open European Day of Resilient Cities 2018, held in April in Bonn, Germany. With many cities and towns from across Europe gathered together, it was an ideal opportunity to share GrowGreen’s experiences with citizen engagement in Manchester and Wroclaw and learn how it’s done elsewhere. 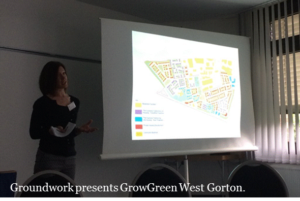 GrowGreen will develop pocket parks, green streets and other nature-based solutions to tackle flooding and heat stress in the neighbourhoods of Olbin, Wroclaw, and West Gorton, Manchester. One of the priorities for both cities was to get residents involved in the development process right from the beginning. In Wroclaw, local people were asked to suggest locations for nature-based solutions. Within three or four weeks, the team had received over 130 proposals from residents describing why they would like pocket parks in their neighbourhood’s backyard. From these, seven were selected to eventually become parks. In Manchester, local residents have responded to questionnaires and events organised by community charity Groundwork, telling us what they like and don’t like about their current spaces, how they use green space and green routes and what they would like to see more of. But communicating effectively with the diverse types of people in these areas, from young kids to seniors who have lived in the neighbourhood all their lives, is a challenge. The training session explored ways to connect with them and get them involved in nature-based solutions. Session participants put themselves in the shoes of various characters from the two cities, such as 68 year old Jakob from Wroclaw, who values a sense of belonging and maintaining traditions. They were asked to imagine what he, and each of the other characters, does, thinks and feels in relation to green spaces in his neighbourhood. Using their sense of empathy with the character, participants came up with ideas for how each type of person can best be engaged in GrowGreen. Discussions were lively and participants from across the world contributed their experiences from their own cities and neighbourhoods. Ultimately, they decided that the best communication relies on stepping outside your own experiences to empathise with your audience, understanding your audience members’ unique characteristics, and engaging with their emotions. 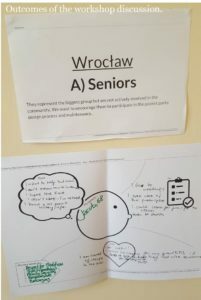 As the GrowGreen teams work on designs for the pocket parks and other nature-based solutions planned in Manchester and Wroclaw, the conclusions of the training session will be put in practice. Local residents will be invited to contribute their ideas at workshops, a virtual tour held in Manchester, and information sessions so that the final designs meet their needs.